There’s a good chance you’ve seen it already. It was a warm Wednesday afternoon in Miami. 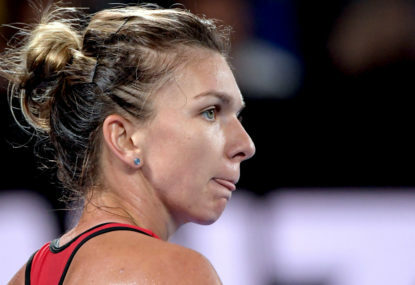 Simona Halep strode back to her chair and sat herself down in a dejected slump. 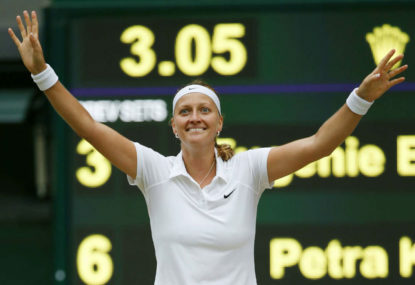 Not so long ago, Petra Kvitova’s career hung in the balance. Following a knife attack in her home, which damaged the tendons in her playing hand, many doubted she’d ever play at the highest level again. Some 15 years ago, Australia’s mainstream sporting community baulked incredulously as Anthony Mundine turned his back on a successful rugby league career to become a professional boxer. Leading into his world heavyweight title bout, Alex Leapai promised the world he would show his championship heart. He lived up to his claim on Saturday night in Oberhausen, Germany, refusing to take a backward step even when it would have been wise. At the beginning of the year, talk of anyone but tennis’ big four winning a Masters 1000, let alone a grand slam, was ludicrous. What’s especially interesting is that many of these tournaments already have the system in place for television purposes, but not for officiating. I agree that it lets everybody down… including the officials! I remember a match in which Caroline Wozniacki was admonishing a chair umpire over a call and said something to the effect of “I wish we had hawkeye here!”… and the umpire replied that he wished they had it too! At the end of the day, they’re human and they make mistakes. But we need a back up for human error. Piling more human error on top of it is the definition of folly. I’m gonna be honest with you Johnno, I don’t know how we got onto most of the topics you’re going on about. But since you took the time to reply, I’ll entertain you. My issue with the current system of umpiring on clay is that it isn’t effective at resolving line call disputes, it’s as simple as that. In recent memory, I can, in fact, recall times when a mark on a hardcourt would imply that a Hawkeye ruling was wrong, but it is an absolute rarity and there was no conclusive evidence to suggest it was actually wrong. With hardcourt as with clay, the interpretation of a ball mark on a court can be deceiving. On the other hand, we haven’t even started main draw play at Roland Garros yet and we’ve already had numerous notable incidents of conflict in this claycourt season alone: Dimitrov vs Nishikori, Donaldson vs Ramos-Vinolas and of course Pliskova vs Sakkari. Now, the fact that I’ve placed myself firmly in the camp of wanting a system introduced that would rectify these wrong calls would imply that I actually have the utmost respect for the rules of tennis, and do not want to see quality matches marred by bad officiating. So I’m not sure how you decided I want so many jarring changes to the way the actual sport works. And even though I’m “probably” a young whippersnapper with no regard for tradition, I have been able to watch Lleyton Hewitt’s entire Davis Cup Career, and it has given me some of my fondest memories as a tennis fan. His victories over Roger Federer (2000 and 2003 both), beating Guga Kuerten in Brazil when Guga was the dominant force on clay, our win over France or our revenge victory over Spain. I am staunchly opposed to the proposed changes to this historic competition. I don’t see how the similarities between surfaces nowadays relates to the officiating of line calls. Do you not see any need to update the clay court umpiring system then? She was showing great form before she withdrew from Doha as well, handing two of her three opponents bagel sets. Clearly little more recovery needed, but the competitive edge was definitely still there. Clijsters also came up short four times before her slam breakthrough, and like Murray, has since put together a Hall of Fame resume. And as she said on the podium in Melbourne, she hopes to be fourth time lucky! In Doha Halep said her objective above all else now is to just keep finding ways to win each match, above rankings or titles. A strategy (obviously) bound to foster results, but also one that seems to have worked for Caroline Wozniacki; Woz won more matches than any other player on the WTA tour last year, and despite losing 6 out of 8 finals, never lost belief, and finished the year by winning the tour finals in Singapore. And we all saw what happened since then. I look forward to an incredibly competitive season this year, with Serena Williams soon to return and Svitolina now officially joining the likes of Halep, Wozniacki, Kvitova and of course Kerber as 2018 tournament winners, having just taken the title in Dubai. As do I! 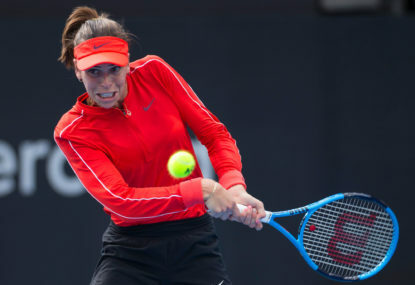 It will be a hotly contested clay season, Muguruza looks to be gaining some form after a lacklustre start to the season, and Svitolina is always a threat. And Wozniacki played a great tournament in Doha, lost a tough one to Kvitova! It has been absolutely great watching her come back into form too. Simona is due to return at Indian Wells, and of course Miami. The desert double should be a good indicator of how everyone’s coming along! Couldn’t agree more. I can’t recall seeing such a tough, gritty run to the Australian Open final since Lleyton Hewitt in ’05! Halep’s game was always there (although great point about the shot making, Agassi cited Lleyton Hewitt as one of the greatest shot selectors in the history of the sport, and attributed much of it to Darren Cahill), but the turnaround since the incident in Miami has been absolutely incredible, and it really goes to show how much tennis really is a battle of the mind. If she continues playing with this kind of belief and determination, there are certainly slams in her future. The very near future at that! I agree. Both had 2 slams and 2 finals, but Hewitt’s career titles and weeks at #1 clinch it for me. If not for an ill-timed bout of chicken pox, he’d have won the Aussie Open in 2002 as well… he was undoubtedly the best hardcourt player in the world at that time. I’ll never forget watching Lleyton beat Andy Roddick, Tommy Haas, Yevgeny Kafelnikov and Pete Sampras to win the US Open. Wimbledon is probably seen as his crowning achievement, but the draw he overcame in Flushing Meadows was staggering. A close second would be Davis Cup 2003… Hewitt’s epic comeback from two sets down against Roger Federer in the semi final, followed by sweet revenge over Spain in the final. If I may…. COME OOOOOOON!!!!!!!! Mayweather has arguably been the best for over a decade, yet back then he made less money by quantities numbering in tens of millions. His fights were more exciting then too, with 24 of his 26 knockouts coming pre 2006, over competition no less fierce. Of course there are plenty more reasons why he’s the highest earning sportsman in the world, but that’s a different discussion. It’s a pity we’re only just touching on the NRL career now. The issue of the carry-over fame Mundine brought with him from the NRL is a much more interesting topic than splitting hairs over annual rankings from ten years ago. There’s also an interesting talking point in why Mundine thought he had to play the villain, given the level of fame he already had. I relate it to the point you made about how many of our boxers have fought abroad to so little attention back home. When Anthony Mundine slammed Jeff Fenech in the press, saying he won his titles fighting Thai cab drivers, I didn’t think it was a genuine reflection of his personality. As with all his theatrics, I took it with a grain of salt. But, being a live attendee at Aussie stadium the day he fought Danny Green, the thousands of people booing when his name was announced did not. Granted the boos are heard amid cheers, but note that in the second paragraph of my article, I describe Mundine as a polarising figure, not a hated one. For what it’s worth, I was supporting Mundine that night. Also, I noticed that you wouldn’t acknowledge Nate Campbell as an undisputed champ despite being unified and holding super champion status. Fair enough. Given the mess of red tape that is boxing these days, some have eased up on their definition of what it is to be undisputed (in reference to Wlad Klitshcko for example). 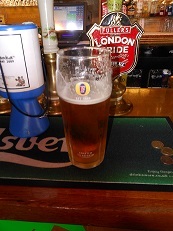 I, however, am a staunch traditionalist. If a fighter doesn’t hold all the major belts, he is not undisputed. Because I am a staunch traditionalist, I flat-out refuse to recognise the IBO as a legitimate world title. In fact, I’m still loath to even acknowledge the WBO. So while Anthony Mundine’s victory over Geale is very impressive, especially given the stage of his career, I consider it redundant to mention the IBO belt. I could probably bang out another 2000 words right now just on the topic of sanctioning bodies and politics within the sport, but I don’t wanna bore you to tears. All the best. First of all, my post absolutely does not imply that Mundine does not deserve the high profile he has. This article was intended as a commentary on self-promotion in the fight game, of which Anthony Mundine has proven himself a master. It makes sense that Mundine’s name and image would feature in the title. I used Peden and Katsidis to highlight a glaring inconsistency in the logic of some of Mundine’s haters. There have always been people who were quick to judge his antics, and claim they’d be a fan of his if he shut his mouth and got on with it. The fact that the achievements of Peden and Katsidis can virtually slip under the national radar would say otherwise. And I have not, in any way, attempted to downplay Mundine’s achievements. I believe quiet achievers do deserve more recognition on the strength of their own merits, not that they deserve more recognition than Anthony Mundine on general principle. Secondly, no, of course you’re not personally trying to influence people with rankings from The Ring, but you cited them as a reason why Mundine has enjoyed greater recognition among Aussie sports fans. I’m of the belief that most sports fans aren’t familiar with The Ring’s annual rankings. If you meant to cite them more as a general indication that Mundine was an accomplished fighter, you needn’t have bothered. If you didn’t want me to interpret it that way, you shouldn’t have written it that way, end of. Thirdly, while everything you posted was factually correct, it doesn’t make sense to use these things retrospectively as a reason why Mundine’s career has received broad coverage and national interest since day one. People didn’t tune in to watch him fight Timo Masua and Gerard Zohs because he would go on to have dual world title reigns and show amazing longevity in his career. They had no way of knowing. 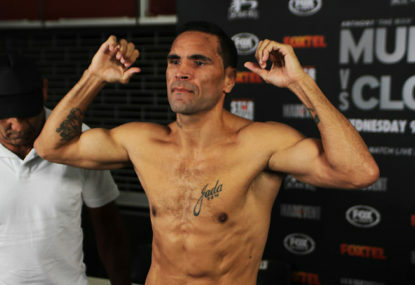 Leading into his fight with Echols, Mundine’s face emblazoned the covers of sports pages in the major newspapers, despite the fact that he hadn’t won a title yet. I am aware of Echols’ placement in The Ring’s rankings, but the directions Echols’ and Campbell’s careers took demonstrates the point that rankings can be deceiving. Fourth, no the world wasn’t crying out for Peden vs Barrera, but nor were they crying out for Mundine vs Ottke or Kessler. And yet both of the latter got extensive national attention, Mundine vs Ottke saw pubs around the country open their doors at 4am. Mundine was a prohibitive underdog in both of those fights just as Peden was against Barrera, but Peden was facing an ATG in a unification bout. Given that you’re affording a lot of credit to average sports fans in terms of world rankings and titles, why do you think Mundine’s unsuccessful title bids garnered so much more local interest than Peden’s unsuccessful unification bid, if Mundine’s infamy played no part? Lastly, call it whatever you want. Playing the villain. Hype. Trash talk. Whatever name you give it, showing hostility and disrespect to an opponent has been one of the most enduring and reliable forms of promotion in all forms of the fight game for decades. In some cases, fighters will talk it up before the fight, and backpedal once the the final bell is rung and the pennies have been counted. In his early career, Mayweather (in what may have been a watershed moment with how he marketed himself) recanted his words against Diego Corrales after their fight was over telling him “What I said was only hype to sell some tickets”. In UFC 124, after Georges St Pierre had systematically destroyed him over 5 brutal rounds, Josh Koscheck admitted to having used trash talk solely to boost the promotion. Some fighters will use this tactic sporadically to sell certain fights, others will basically adopt these loathsome traits full time as a deliberately concocted media persona. I haven’t presented this in a negative light, or presented it as the only way a fighter can gain a following. But I believe the results speak for themselves. Nowhere in my post did I suggest that Robbie Peden or Michael Katsidis are Mundine’s equal in terms of legacy or achievements. I simply noted that, despite the fact that they’ve comported themselves as gentlemen throughout their careers (decorated ones at that), they’ve never enjoyed the recognition that Australia has given Mundine in spades. Not exactly sure why you’re citing The Ring annual rankings in terms of top 5 when they’re presented as a top 10, in which both Peden and Campbell placed multiple times over their careers. Mundine and Peden both won vacant world titles by facing fellow contenders, and while Antwun Echols’ standing in the super middleweight division was certainly stronger than Campbell’s was in super featherweight, the passage of time has given both victories greater context. Echols never held a major world title and currently has a journeyman’s record, whereas Nate Cambpell would become a unified lightweight champion. In terms of Peden’s fights against Marquez and Barrera, it seems as though your focus is on the nature of Peden’s losses rather than the fact that he was relevant enough to face such fighters. Marco Antonio Barrera and Juan Manuel Marquez are both destined to be ranked among the greatest boxers of all time. The argument can be made that Peden faced Marquez before he became a presence on the P4P list, so at the time the fight wasn’t as important as it probably seems in retrospect. But when he faced Barrera, he was facing an established ring legend, and he faced him as a fellow world champion. In the scope of Australian boxing history, it was a very big deal. Fair enough, he came up short, but so did Mundine against Mikkel Kessler. Throughout the late 90’s and early to mid 2000’s, I collected The Ring Magazine religiously, along with various other international boxing magazines. In my experience, they were always at least a month out of date by the time they hit Australian news outlets, and cost the better part of ten to twenty dollars a pop. It’s a bit unrealistic to suggest that rankings published in what are essentially niche market publications such as these (however accurate and relevant they might be) could have a greater influence on the viewing pubic of Australia than the mainstream sporting media, which you yourself say rarely gave Mundine a fair go. I strongly disagree that people won’t pay $50 dollars to watch someone they hate. Yes, I agree that a strong American contender would give heavyweight boxing a much needed shot in the arm in the United States, but I think one of the main problems with the heavyweight division in boxing is that there is generally just so little competition. I’m sure the entire western world would pay attention if the Klitschko brothers finally decided to fight each other (we all know that will never happen, of course). That would be the only thing that could match the spectacle of the old heavyweight superfights that we were lucky enough to have in years gone by… Lewis vs Tyson, Holyfield vs Bowe, Lewis vs Holyfield… even the contenders of the era were exciting. In the last generation alone you had Tua, Ibeabuchi, Rahman, Maskaev, Byrd (who was, in fact, the last American heavyweight champion, beating Vitali but losing to Wlad, although his style was considered boring by most fans). Couple that with the thriving heavyweight division in MMA, where excitement is delivered in spades. Between the fierce competition of the Couture, Emelianenko, Mir era, to the grand spectacle and notoriety brought by Brock Lesnar into the current era of Velasquez, Dos Santos, Overeem, etc…. MMA has created the new heavyweight glamour division, and that just spells more trouble for boxing. Particularly in regards to future generations of fighters, and particularly in the United States, where wrestling is a major competitive sport at school level. After the Toney/Couture farce a few years back, I wouldn’t put anything past Dana White. Despite losing, Vitali’s slugfest with Lennox Lewis was actually one of his best performances in my opinion, and one of the better performances anyone’s had against Lewis. Had him hurt a number of times, just a shame the fight was stopped due to a cut. It’s also a shame to think that that was the last legit heavyweight superfight we’ve had. About 50 dollars, the going rate for a title fight. Leapai was the mandatory challenger for Klitschko’s WBO belt, which he secured by beating Russia’s Denis Boytsov last year. I’m sure some expected it to competitive, but there was probably a great amount of interest from people who just wanted to show support. To be fair, it’s mostly the heavyweight division that has gone under. The Klitschko brothers would have made quite a strong showing in any era, but Wlad is so far above the rest of the pack, his fights often lack excitement. There is still a wealth of interesting fights in the lower divisions with the likes of Mayweather, Andre Ward, Bernard Hopkins, Manny Pacquiao and Danny Garcia holding championship belts. It was a terribly lopsided mismatch, absolutely outgunned physically and completely outclassed technically. The term “puncher’s chance” has always been a fancy way of saying a fighter stands a snowflake’s chance in hell. I do however feel that due credit should be given to Leapai for putting himself in the WBO mandatory challenger position, fair and square. He earned his shot. 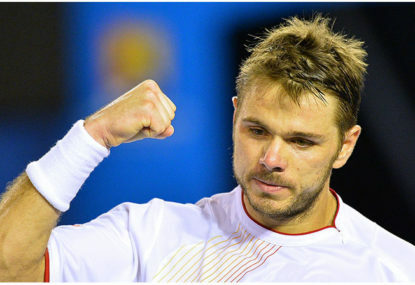 I was quite happy to see both Ferrer and Wawrinka notch wins over their more celebrated countrymen. In the all Swiss final and the all Spanish quarterfinal, the vast majority of support was for Federer and Nadal, respectively. Gotta love an underdog, right? Hopefully injuries don’t play any part at all, as this is one of the most interesting runs into the French we’ve seen for years… and we still have two more 1000 events before then! I’ll be watching Madrid with keen interest to see how the top guys follow up.